Frank, David. "Cape Breton Strikes 1920s". The Canadian Encyclopedia, 31 July 2015, Historica Canada. https://www.thecanadianencyclopedia.ca/en/article/cape-breton-strikes-1920s. Accessed 18 April 2019. The CAPE BRETON labour wars of the early 1920s represented an intense local episode of class conflict similar to the WINNIPEG GENERAL STRIKE (1919). 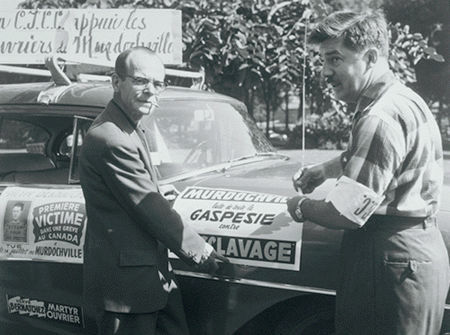 In such conflicts militant unions, often led by radical leaders, were attempting to change the balance of power in Canadian industry by insisting on union recognition and improved living standards for the workers. In Cape Breton, despite an earlier defeat in 1909-10, the coal miners had won recognition of District 26, United Mine Workers of America, in 1919. Their main antagonist was the Montréal-based British Empire Steel Corp, which dominated the coal and steel industry in the Maritimes after 1920. Unfortunately, this company faced problems in maintaining traditional markets in central Canada and in surviving its own financial mismanagement. Determined to save costs by reducing wages, the company met strenuous resistance from its employees. In the closely knit single-industry towns of Cape Breton, the unions benefited from a network of local loyalties, such as the widely shared Scottish background of the coal miners and their support for labour parties, co-operatives and workers' control in industry. Dramatic confrontations followed, and 3 major strikes accounted for more than 2 million striker-days. There were also a large number of short, local strikes, often over work-discipline and managerial authority in the mines. At the company's request, provincial police and federal troops were ordered into the coal and steel towns. The labour wars lasted 4 years. In 1922, when the company introduced a one-third reduction in wages, the coal miners responded by restricting output at the pits and reducing production by one-third. When the SYDNEY steelworkers went on strike in 1923 seeking union recognition, the provincial police turned out in force and charged through the streets of Whitney Pier. The coal miners came out in a sympathetic strike, but this ended in the arrest of 2 union leaders, Dan Livingstone and J.B. MCLACHLAN, on charges of seditious libel, and the temporary suspension of District 26 by the international office of the UMWA. In 1925 the coal miners continued to face short time and wage reductions at the mines. When the company cut off credit at the company stores, local communities threw their resources behind the coal miners and the desperate conditions in the coalfield began to attract headlines and sympathy across the country. 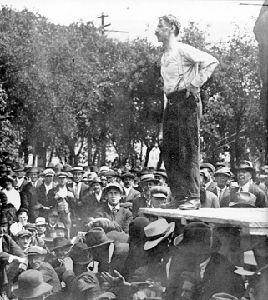 The 1925 strike lasted 5 months and culminated in a bloody battle at Waterford Lake, where coal miner William Davis was killed by company police on 11 June 1925. In the end the British Empire Steel Corp was chastised by a royal commission in 1926 for its unenlightened labour policies and subsequently collapsed into bankruptcy. The use of the armed forces had been a highly unpopular aspect of the strikes, and the federal government took steps to restrict the ease with which the troops could be called out in labour disputes. In their epic battle for union recognition, the coal miners had succeeded in preserving their union and in partly protecting their living standards. In the case of the steelworkers, union recognition was achieved in the 1930s, when Premier Angus L. MACDONALD, remembering the earlier conflict, introduced the first Nova Scotia Trade Union Act (1937), protecting the right to collective bargaining. The unions' aim of public ownership for the coal and steel industries, which they believed would bring about a more responsible form of economic development for the area, was not achieved, however, until the final withdrawal of private enterprise in 1967. The Cape Breton labour wars marked the growth of a persistent tradition of working-class consciousness, which is often reflected in local culture and politics. The death of William Davis in 1925 is still remembered on June 11 each year, which is marked as a Miners' Memorial Day. See also WORKING-CLASS HISTORY and various entries under LABOUR.